Konden is a mask which walks fast and dances. And this rhythm, Konden is a mask dance dedicated to the young men between the ages of fifteen and twenty. 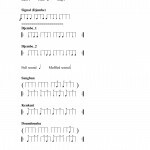 This rhythm, especially dunun voices, varies by region. This Konden 2 is the version from the area around Kurussa.